They are the first piece of furniture in a house, a real business card, the first impression conveyed by the house. The doors with aluminium profiles designed by Doal have a polite, essential and modern style and are appreciated by an heterogenous target of consumers. They have always been the main characters of the interiors. They are the opening that connects two environments and the division of the spaces makes a difference thanks to them. They define the taste, the way of living and the style that you want to give to your home. Doal realises infinite solutions for interior doors. Functionality, harmony and design are the key words to describe them. Doal supplies aluminium systems that can satisfy every need following the market demands. The company offers ideal solutions to organise the functional areas and they can be divided into areas of small dimensions. 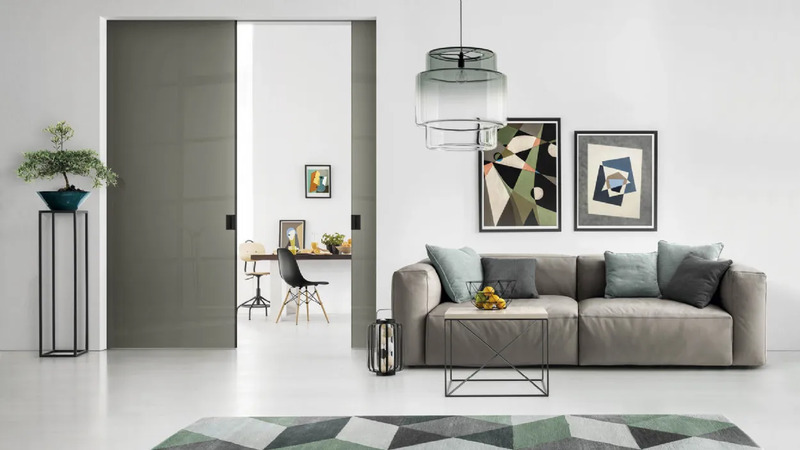 Among the various types of doors we can find the internal sliding doors, which can be external wall and pocket door, that means they are built-in and have an appropriate subframe that guarantees a more aesthetical and minimalist impact. The single or double leaf doors are defined with a pivot and around it rotates a door, normally made of wood or glass. They are available in different materials and finishes you have to discover: don’t hesitate to ask for anything. They can be chosen for walk-in wardrobes too. Hinged doors can be used in various and different environments such as public buildings, cafes or domestic spaces, for the kitchen or the living room, but also in modern clinics that can have hinged doors made of glass or custom-made solutions. Good sliding shutters are fundamental to create a suspended sliding door, each door can thus be defined as a shutter. We offer various solutions to customise your house thanks to the shutters with aluminium frame that are very light. Today, interior doors are no longer just dividing elements, but become real furnishing elements and often reflect the personality of those who live in a given house, also contributing to enhance the style you have chosen. This is possible thanks to an offer on the market that appears increasingly wide and therefore is able to satisfy any preference in terms of design. Interior doors define the space, are practical and functional and give shape to the most diverse expressions of design. The most classic wooden ones do not fade away, on the contrary they confirm their appeal over time; they are flanked by the modern ones, often made of aluminium and combined with glass or melamine panels. Traditional hinged doors are still the most popular, even if they are increasingly popular with sliding doors, thanks to their attractive image and small footprint that allows you to save precious centimeters: this is a fundamental added value, especially in smaller houses. Focusing on new trends, it is necessary to point out how architects show a preference for flush to the wall doors and doors in light; the explanation lies also in the versatility and flexibility of aluminium, thanks to which the doors blend in leaving the walls "clean" as suggested by the minimalist style so in vogue these days. The retractable sliding door for walled boxes is also very well rated: the doors slide inside optimising the available surfaces. A good alternative is the sliding door with track on the ground or on the ceiling. Several models are also used as sliding doors for walk-in wardrobes. In all cases, Doal offers a number of interesting proposals: the catalogue offers a wide choice not only of door structures, but also of materials and finishes. With the help of Doal consultants, it is easy to find the best solution for your needs and proceed with the definition of an ad hoc project that is the result of a perfect mix of aesthetics and functionality. Doal glass and aluminium interior doors can also be customised with sandblasted decorations: the company offers a rich and stylistically varied series of drawings made by professionals of the sector and with attention to every detail. Currently there are more than three hundred different decorations. And that is not all. Doal interior doors can be stamped with the name of the owner of the house or a specific logo. Furthermore, customers have the opportunity to request that a design they have created and produced appear on the door of their home. Doal doors are of excellent quality, perfect ambassadors of Made in Italy. They are the result of the combination of creativity and the use of the most innovative technologies. Whatever the need, Doal promptly provides concrete answers. Prices are always competitive, estimates are free.